This multi-year project is building on the Community – kea project plan (funded by DOC) and Fiordland kea sightings project initiated in partnership with the Fiordland Wapiti Foundation (FWF) in March 2016. The broader monitoring of kea in Fiordland NP project has 3 main aims: i) run an annual community (FWF) kea survey in March-April, ii) run a formal summer kea population survey and catch trip annually (year 1) to enable attachment of transmitters and bands to adult females and bands to adult males, fledglings and juveniles (beginning January 2018), and iii) monitor kea nest productivity and predator impact through the following breeding seasons and develop a predator control grid network as necessary. All data collected will be analysed to establish a baseline for the local kea population and to develop a sustainable community protection programme for Fiordland kea. This project is important for kea conservation efforts for the following reasons; i) little is known about the population status of kea in the Fiordland NP, ii) this area has expressed extensive, ongoing commitment by the local community (Fiordland Wapiti Foundation and membership), iii) kea are considered an important species to the wider community and concern has been raised as to anecdotal reports of decreasing numbers and iv) there is currently no management or support directed towards local kea populations. Little is known about the Fiordland kea population. A 3 year population survey covering approximately 4,000 ha, was conducted in the Borland Valley in January 2009, 2011 and 2012. This area has no pest control programmes in place. A total of 17 kea were caught up over the 3 years (7 adult males, 3 adult females, 6 subadult males and 1 fledgling). A total of 8 transmitters were attached (2011 and 2012). Follow up nest monitoring occurred in 2009, 2011 and 2012 but was hampered due to high snowfall closing the Borland Rd and difficulty locating nests. 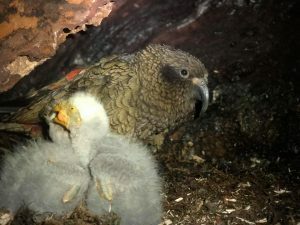 Overall, kea sightings and fledglings produced were significantly lower than other survey sites (Nelson Lakes and the Hawdon Valley in Arthur’s Pass). committed to sending in sightings of kea across years due to concerns of declining kea populations in the area. This level of community support for kea in such an extensive area is one of a kind and makes this project particularly unique. Funded by Paradise Valley Springs, Clever Kiwi Company and Nga Whenua Rahui. Supported by Fiordland DOC and The Fiordland Wapiti Foundation. The first of the kea survey trips ran for 8 nights in January 2018. 28 sites were surveyed for 3 hours each night and 3 hours each morning. 14 personnel made up the survey team (experienced kea handlers teamed up with volunteers from the Fiordland Wapiti Foundation, Nga Whenua Rahui and DOC). 44 kea were caught and banded during the survey period and 2 adult females and 1 male were fitted with transmitters to allow for follow up nest monitoring this coming breeding season. The majority of kea were adults with a few subadults, 2 juveniles and only 2 fledglings. Thank you to all of those people and organisations involved in this first year of the survey. We couldnt have done it without you! Funded by Paradise Valley Springs, Clever Kiwi Company, Denver Zoo and “Name a Kea” donors. This years survey is set to run from the 17th January 2019. We will update this page as soon as results come in. Want to get involved? Name and sponsor a Stuart Mountains, Fiordland Kea! We need more funding to help this project run over the next few years. With a donation of $500, you or your organisation can name one of our banded survey kea – to find out which kea you can sponsor, follow the link to our Name a Kea page or visit our Give a Little page to make a donation now. Thank you to the following donors – we couldnt have done this work without your support!